Mansfield Fairfield 8mm Film Action Editor was made in the early 1960,s, the included original receipt shows a purchase date of December 16 1063 from a store called Korvette. Rugged metal body, in good age specific condition. Ran a few frames of film thought it with no issues. Includes Mansfile d 8mm Film Editor, original Box, Original Receipt, and Original Owners Manual. The body measures approximately 11 inches at base, 6 1/2 inches wide, and 7 inches high. Arms extended approximately 17 inches. 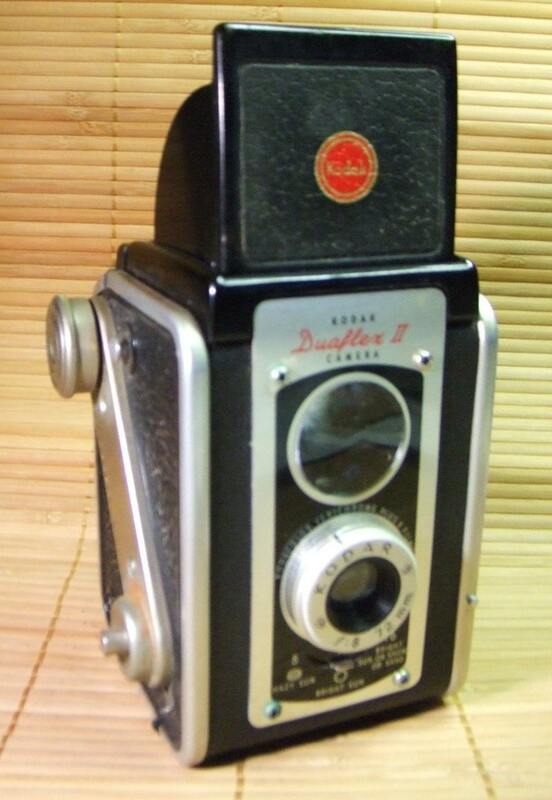 This 1952 vintage Kodak Duaflex camera is about as retro as you can get. Comes inside a great leather case that has very little wear. The camera is in excellent vintage condition. I should point out right away that there were quite a few variations of the Duaflex and Duaflex II, both here and in the UK, and not all models had a focusing taking lens. This is as close to a top-of-the-line model as you’ll see for this camera, with not only 3 aperture choices and a focusing taking lens, but a double-exposure prevention button. * Produced 1950-54 (Dec. 1952) Eastman Kodak Co. The Kodak Duaflex is a 620 roll film pseudo TLR made by Kodak in the US and UK. The original versions were available from December 1947 – September 1950 in the US, and 1949-1955 in the UK; the Duaflex IV was finally discontinued in the US in March 1960. The various Duaflexes had aluminum alloy bodies and were available with either a simple fixed focus 75mm f/15 Kodet lens, or with a 72mm f/8 Kodar triplet lens in a front-element focusing (to 3.5 ft.) mount. The Kodar lens had Waterhouse stops of f/8, 11, and 16. The shutter had speeds of “I” and “B”, and was synched for use with a Kodalite Flash-holder. * Unique or almost unique - some items were custom made, and others were manufactured in small quantities. * Detailing: hand finishing, unusual, handmade. * Style: vintage has traditionally been the favourite of creative personalities because it offers an enormously wide range of imaginative styles. * Investment: some people buy to collect and increasingly, good quality vintage items especially items by well-known designers are sought after by collectors. Retro is a word used to describe, denote or classify culturally outdated aged trends or fashions, from the overall postmodern world, but have since that time become functionally or stylishly useful once again. The use of "retro" style iconography and imagery interjected into post-modern art, advertising, mass media, and decor. has occurred from around the time of industrial revolution to the present day. Looking for something not listed ? We may be able to find it or just don’t have it listed yet. What is a Bazaar ? A bazaar is a merchandising area or marketplace of shops where goods and services are exchanged or sold. The word derives from the Persian word bāzār, the etymology of which goes back to the Middle Persian word baha-char (بهاچار), meaning "the place of prices".Although the current meaning of the word is believed to have originated in Persia, its use has spread and now has been accepted into the vernacular in countries around the world. In North America, the term can be used as a synonym for a "rummage sale", to describe charity fund raising events held by churches and other community organizations, in which donated, used goods, such as books, clothes, and household items are sold for low prices, or else the goods may be new, handcrafted or home-baked, as at a church's Christmas bazaar.